Why Didn't Your Doctor Prescribe A Generic? Look In The Mirror. 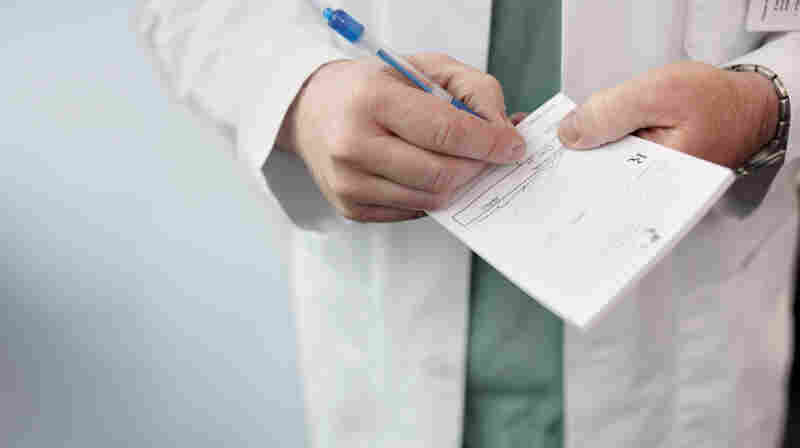 : Shots - Health News Doctors' apparent willingness to prescribe brand-name drugs instead of generics in response to patients' requests is associated with their acceptance of free food from drugmakers, a study finds. We're living in the golden age of generic drugs. Eight in 10 prescriptions are filled with generics rather than brand-name drugs these days. The generics are usually inexpensive. Think $4 for a month's supply of the depression drug fluoxetine (or Prozac) at Wal-Mart. If you have insurance that covers pharmaceuticals, your copay will be lower with a generic than a brand-name drug, too. So when there's a generic available, why do doctors still write prescriptions for the brand? One reason: You asked for it. Some 37 percent of doctors surveyed say they sometimes go ahead and prescribe a brand-name drug upon request, even when there's a generic available. The researchers found that doctors' willingness to prescribe a brand was associated with their acceptance of free food from drugmakers. They were also more likely to accept samples of brand-name drugs to hand out to their patients, too. The findings were just published online by JAMA Internal Medicine. The researchers figure their estimates of doctors' willingness to prescribe a brand are at the low end of what happens in reality. Doctors surveyed (about 1,900 in this study) may not be inclined to fess up about going along with patients' requests. One limitation of this study is that the researchers can't be sure exactly which drugs patients got. Pharmacists in many states can substitute a generic, when it's available, to fill a doctor's prescription for a brand. An accompanying editorial calls for direct action to overcome prescriptions driven by "irrational cultural practices." Some health systems override physicians' prescriptions choices when there's a generic option. And the editorial says that measures like that "have immense potential to increase value in prescription medication use."